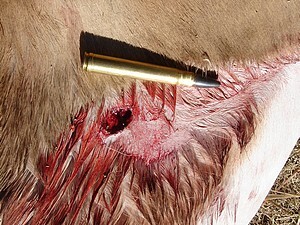 Shot a good Impala ram today using the 200 grain HV running at 3250 fps. Shot was 80 metres uphill and was taken free standing. At the shot the ram charged downhill for about 30 metres making for an easy recovery. Attached photos show entrance and exit wounds. Entrance was on the shoulder shattering the bone but with almost no bruising. 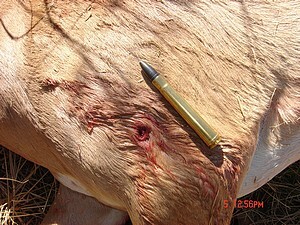 The farmer, Johan Claasen, was amazed at the lack of damage compared to his 270. 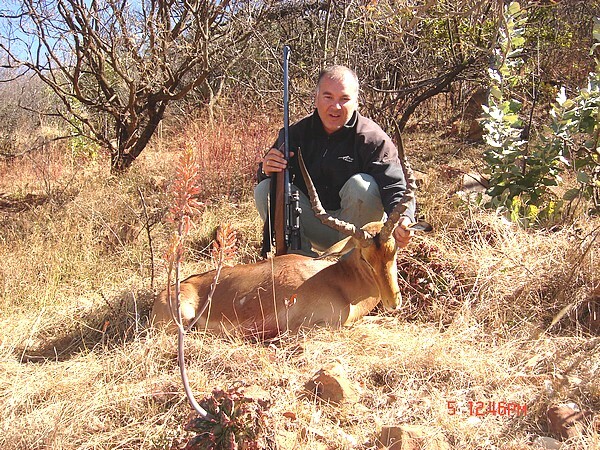 The blesbuck was shot off sticks at 120 metres so I was able to shoot it in the neck. It went down at the shot. The bullet shattered the neck and the bit of damage was caused by the many bone splinters. I also recovered one of the petals embedded in the spine. This was one of the coldest hunts I have ever attended and we must have walked a good 40 kilometers in two days just to keep warm. Anyway, body and mind are weary and need some rest.